Crumble the yeast in a bowl. Add the milk and stir. Add butter, sugar, vanilla sugar and flour, and work into a smooth dough. Roll out the dough - this is surprisingly easy - into a large square, about 40 by 40 cm. Do this on a lightly floured surface. Cut small squares, about 8x8 cm. Stir together all ingredients for the filling. Place a small spoon of filling on each square, and fold up all corners towards the middle. Pinch together. 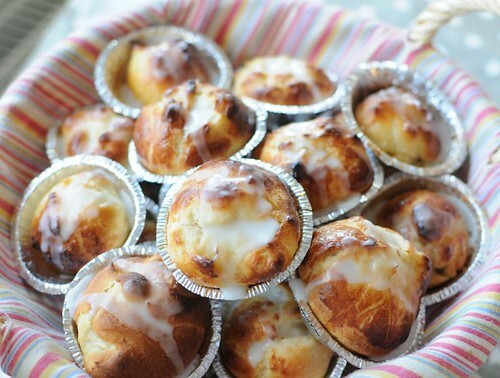 Place each bun in a small foil cup (or muffin liner) and place on a baking sheet. Leave to rise, covered with a towel, for two hours. Brush with eggwash and bake at 250° for 6-8 minutes. Let the buns cool completely, before stirring together the powdered sugar and water, and glazing the buns. I couldn't resist making the rimbo buns right away. I added cinnamon to the filling. While they baked, the house smelled so wonderfully of cinnamon and vanilla sugar. My husband decided that maple syrup would be a good topping. He says no need to freeze any of them - he'll be taking care of them quickly.